Cable length considerations with Incremental Encoders - Quantum Devices, Inc. The QD145, QD200 and QR12 series of optical encoders have 28 AWG conductors in the standard flying lead cable. This gauge of cable is excellent for tight bends and fitting in applications where space is a premium. The conductors can easily handle the 250 mA max current requirement of the encoder. A smaller gauge conductor means that there will be a limit to the length of the cable. This is due to the DC resistive loss in the conductor that causes a slight voltage drop. The longer the cable, the greater the voltage drop. This voltage drop reduces the voltage seen at the encoder. For an incremental encoder with a 28 AWG cable operating at 5VDC, this limitation occurs at 17.85 feet. 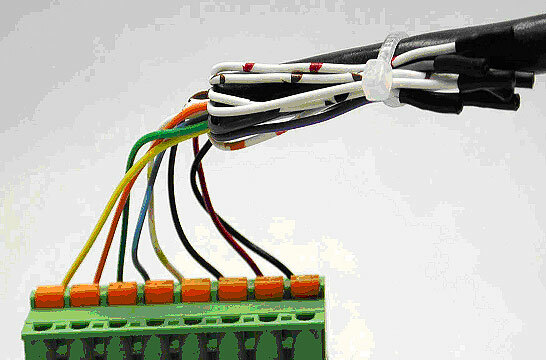 1) Splice the cable and go with a larger wire gauge for longer cable runs. 2) Increase the power supply voltage to compensate for the voltage drop in the cable. 3) For Incremental only (Non-commutated Encoders) Quantum Devices offers a 26 AWG cable. 26 AWG conductors bring the cable length limitation to 28.1 feet. For other options, or help in determining the right wire gauge or incremental encoder for your application, you can reach Jim at (608) 924-300.